Save 10% on supplies with your VersaLink C9000 purchase (available at checkout). Professional Color, Media Flexibility and Benchmark Reliability. 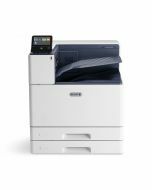 The Xerox® VersaLink® C9000 is the printer of choice for graphic arts professionals and internal design groups alike. They rely on the VersaLink C9000 Color Printer's consistently vibrant image quality, professional color management tools and outstanding media flexibility to bring their ideas to life. Plus, app-based workflow customization and network, mobile and cloud connectivity take performance to new levels. Build Profit Potential; Keep Print Work In-house. True 1200 x 2400 dpi print resolution enables realistic-looking photos, presentation-quality graphics and fine-line detail for sharp text, even in small fonts. PANTONE® calibrated solid-color simulations work in concert with Xerox® Color Correction technology and true Adobe® PostScript® 3™ to deliver results that match your expectations. The spot color editor easily addresses any spot color in need of a tweak. Simply change the CMYK values through the Embedded Web Server and your colors are truly spot-on. Hit color targets with vivid images, rich and deep blacks, and smooth color transitions, without streaking, banding or striping. Impress clients with output that matches what they’d get from a professional print shop. Choose media weights from 75 to 350 gsm, and sizes from 3.5 x 3.9 inches to 12.6 x 52 inches, plus an array of advanced finishing options. Automate production of booklets, brochures, proposals, newsletters, manuals, business cards, packaging, signage, window decals, invitations, direct mail and more. The optional Xerox® Precise Color Management System combines powerful software with the Xerox® Precise Color Meter powered by X-Rite. This adds professional-level color control that helps maintain color accuracy print after print, and across all output devices. Create custom color sets that emulate larger press equipment, allowing in-house creation of prepress proofs. Quickly set/reset saved color profiles to keep your workflows efficient. Calibrate your monitor and the VersaLink C9000 to match colors from swatch books or color tables, ensuring accurately matched screen-to-print colors. Fine-tune existing spot colors, and create new, unique spot colors for color proofs. Hassle-free installation wizards and step-by-step configuration options ensure you’re ready to go, right out of the box. With fewer moving parts, stronger paper-path components and an advanced imaging system, the VersaLink C9000 is designed for long-term reliability. Stringent security features, including Secure Print and card authentication, help control access and safeguard critical information. Customizable, capacitive, 5-inch color touchscreen lets you tap, swipe and scroll your way through tasks with mobile-like ease. 1-Touch Apps automate multistep workflows for individuals or groups, and Simple ID lets them enter a user ID and password once, and then enjoy fast, secure access to task presets, favorite contacts and commonly used apps on a personalized home screen. Connect When and How You Want. 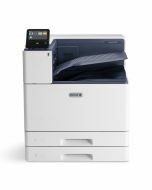 Connect and print from multiple devices with Apple® AirPrint®, Google Cloud Print™, Xerox® Print Service Plug-in for Android™, Near Field Communication (NFC) Tap-to-Pair and Mopria®, plus optional Wi-Fi and Wi-Fi Direct. Easily add connectivity to Google Drive™, Microsoft® OneDrive® and Dropbox™, and access additional options through the Xerox App Gallery. 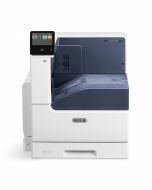 Xerox® ConnectKey® Technology brings an intuitive user experience, mobile- and cloud-readiness and benchmark security to your VersaLink C9000 color printer, as well as easy integration with Xerox Managed Print Services. Product Size Dimensions (WxDxH): 24.4 x 28.5 x 31.9 in. Media Sizes Custom sizes: 3.5 x 3.9 in. to 12.6 x 19 in.